Ok, so you’re ready to get started on your project, with a plan, materials list, and tools. However, the most powerful tool you’ll bring to your DIY project is your brain, with its enthusiasm, curiosity, and desire to expand your building knowledge and skillset. 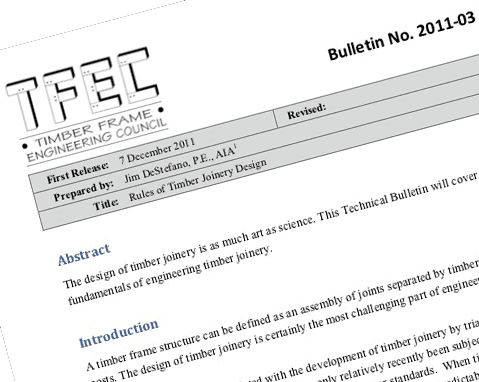 To enhance that tool even further, we recommend checking out the Timber Frame Engineering Council’s bulletin on the rules of timber joinery design before you unload your materials or pick up your mallet. The Rules of Timber Joinery Design, prepared by Jim DeStefano, P.E., provides a summation of the core tenets of engineering timber joinery. In it, Mr. DeStefano notes the long tradition of timber joinery has only recently become subject to modern engineering standards but that those traditional joinery methods perform in a somewhat predictable and reliable way. The geometry of the joint should have mating surfaces that allow all structural loads to be transferred in bearing of one member against the other. The wood removed to create the joint should not unduly weaken either member. The geometry of the joint should not be altered by shrinkage of the wood and bearing surfaces should remain in tight contact. Anticipate all potential modes of failure and provide sufficient strength to resist each potential failure mode. This bulletin is an essential reference when building a frame, large or small, simple or complex: it is a reminder for us all to “get back to basics” when it comes to building a timber frame. Read the full bulletin HERE.